Last Sunday was Father's day in Austria. So I told Danny he had to pick one... he wasn't getting two ;) LOL! (Mother's day is the same day here as it is in the US). We did go out to eat last weekend with friends from our Bible study group and had a great time celebrating those Dad's too. Today the boys and I made Danny his favorite egg and cheese grilled sandwich and served it in bed. He received a cool hand painted (by Nate) pen/pencil holder type-of-cup-thing last weekend that Nate had made in Kindergarten. So from all of us he got 2 small bottles of Dr. Pepper (which we don't get very often) and two small pints of very nice, but a bit expensive, almost Blue Bell, ice cream. I made him his favorite friend chicken nuggets with homemade gravy and mashed potatoes for lunch and then ordered pizza for supper. If I do say so myself, he had a nice day ;) So to this very important man in my life--- thanks for the great Dad that you are to our 2 blessings from heaven. The way both boys have spent time at the front door waiting for you to come home from a day visiting or from school speaks volumes of the importance of your presence in our home. I couldn't have asked for a better friend, husband, father, or a leader of this family. We love you, Babe/Daddy!! To my Dad: You've always had a listening ear for me. I remember when I was really struggling with school and after hours of studying still couldn't seem to do well enough. Tests were/are hard for me. You were always so encouraging and reminding me that if I did my best then that's all you & Mom asked of us. You and Mom have always loved us - no matter what. You pray for me and with me. It's been so great to know that you're a phone call or ichat away. You were what I measured guys up against when I started dating. You were what made me fall in love with Danny. I knew what to look for in a guy--from the simplicity of opening of doors for me to respecting me, honoring your requests if he was going to date me, having integrity, a walk with God, a love for others, etc.... Thanks for all that you & Mom do for us and have ever done for us, I love you, Dad. To my Dad-in-law: You are one of the reasons why Danny turned out the way he did. Thank you for raising him with a knowledge of God and a respect for others. Thank you for taking the time to find a church for your family to be involved-this led him to camps then eventually to BBC where we met. Thanks for all you do for us. We love you. My Heavenly Father: You have given me life and even more importantly-eternal life. You've given me unconditional love. I don't deserve it, but I do thank You and pray that I'm ever mindful of it as I go about my days. Thank you for Danny. 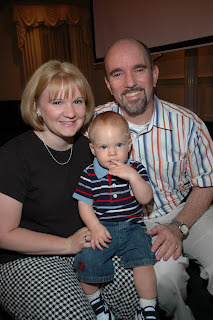 Thank you for entrusting Nathan and Micah to our family. My heart is overwhelmed that you would bless us. Thank you for the promise that we will see our first child one day in Heaven. Thank you for the opportunity to be a light for you in so many different lands. Only You would think I'm worth the trouble of learning yet another language ( we need to talk about this plateau I've been on though). haha. Thank you for the heart to heart talks. Only you know me inside and out. We adore, praise, love, and worship only You.